To someone who has never navigated it, the asylum process in the United States can appear daunting, complicated and confusing. Not only are there different types of asylum, but there are different ways to pursue an asylum case. Recent events surrounding asylum show just how ill-informed the public is about the process. Comments blaming parents for bringing their children across the border illegally are flooding social media sites as anti-immigration advocates try to justify the detention of adult and children asylum-seekers in the United States. This rhetoric demonizes immigrants who pursue asylum the legal and correct way: by surrendering themselves at the United States border and requesting asylum. Before delving into why the current rhetoric is not factual, let’s first answer the question of how the asylum process works in the United States. There are two types of asylum: affirmative asylum and defensive asylum. Affirmative asylum is the process for those who are not in removal proceedings. Removal proceedings are proceedings for an individual who is being removed or deported from the country. 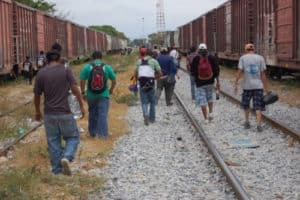 Many who surrender themselves at the border are pursuing affirmative asylum – they have not entered undocumented and have not been placed in removal proceedings. Defensive asylum is for individuals who have already been placed in removal proceedings. For both processes – affirmative and defensive – the asylum seeker has to prove that they fear persecution, harm, torture, or other negative effects by returning to their country of origin. In recent years, affirmative asylum cases have been approved at higher rates than defensive asylum – in 2016, 11,279 individuals were granted affirmative asylum and 8,726 were granted defensive asylum. The requirements for both cases are different and an entirely separate article could be dedicated to comparing and contrasting the two processes. In this article, however, the focus is misconception of asylum as an “easy” process and an examination of the rhetoric surrounding recent events. “The Attorney General shall establish a procedure for […] an alien physically present in the United States or at a land border or port of entry, irrespective of such alien’s status, to apply for asylum, and the alien may be granted asylum in the discretion of the Attorney General is the Attorney General determines that such an alien is a refugee within the meaning if section 101(a)(42)(A)” (8 USC 1158). President Trump is incorrect by asserting that asylum seekers must first apply in Mexico. It is perfectly legal for asylum seekers to turn themselves in at the border or other ports of entry, such as an airport. The United States has laws in place dictating how the refugee and asylum processes should work, and we have an entire system of immigration courts designed to work specifically on these kinds of cases. This proves the second part of the President’s tweet to be incorrect, in which he asserts that the courts are imposing impossible tasks on the United States. Asylum seekers will work with United States Citizenship and Immigration Services (USCIS), which is a department within the larger Department of Homeland Security (DHS) to make an asylum claim and follow through with their case. With a yearly budget of over $40 billion and almost a quarter of a million employees (240,000 to be exact), the President’s lack of knowledge of the third largest cabinet department in the federal government and its operations is alarming. However, though these tweets are not factual, they remain influential. Millions who read and share these messages are also implicitly sharing the inflammatory rhetoric against immigrants that demonizes their intentions and endangers their right to due process. This vitriolic rhetoric stems from rampant misinformation and bigotry towards those lawfully and peacefully seeking asylum. With an influx of migrants seeking safety and a growing number of people who support their detention and abuse, this issue has become a crucial moment in the history of immigration policy and procedure. As established here, those in the caravan moving towards United States are well within their rights to surrendering themselves at the U.S. border. However, those engaging in hateful rhetoric also believe it is well within this country’s right to detain them, strip them of their rights, and deny them the due process to fully pursue an asylum claim. Yesterday, the president’s new executive order attempts to do just that to those who do not claim asylum at official border crossings which are already overwhelmed and backed up with asylum seekers. Lawsuits countering this executive order are likely to be filed eminently. Which side will prevail, no one can say for sure. Nonetheless, the odds are likely on the side of the Trump Administration now that conservatives have a solid 5 to 4 majority on the Supreme Court. In spite of everything, this executive order will not likely deter those seeking safety to do so in the quickest way possible. Where there is will, there is a way, and the will to save oneself, one’s family and one’s children from discrimination, persecution, torture, and death is stronger than the hate that threatens to close our borders to those most desperately in need of our help.